Here at Ashbrook Roofing Supplies we aim to stock all of the aftermarket VELUX accessories that you’ll ever need. As well as the exciting accessories, like colourful blinds and the INTEGRA remote control systems that you’ll find in the VELUX catalogue, don’t forget about the less glamorous ‘nuts and bolts’ installation accessories. For increased energy efficiency we stock VELUX Insulation Collar Kits for most VELUX window frame sizes. For loft conversions in conservation areas our VELUX Recessed Flashing Kits and Glazing Bars can often help to sway a planning decision in your favour. 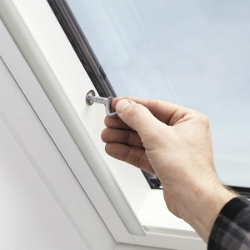 With security and safety in mind, we offer a VELUX Window Lock and an Opening Restrictor. Both items are easy to install with some basic DIY tools. Annual maintenance is just as easy with our VELUX Maintenance Kit. The kit comes complete with grease for squeaks and fresh filters for your ventilators. How about brightening a gloomy bathroom or stairwell with some natural daylight? Our VELUX Sun Tunnels are perfect for the job – particularly with a full range of Sun Tunnel Accessories offering flexible installation options. For out of reach windows we have an inexpensive, VELUX Telescopic Pole to operate the blinds and control bar from ground level. Alternatively, there’s the option of VELUX INTEGRA remotely controlled windows – the last word in luxury! Along with all of these fantastic VELUX Accessories we also offer free, friendly advice and expertise. Just give us a call on 01629 828500.